Ueno is one of the biggest hubs in the east side of Tokyo. 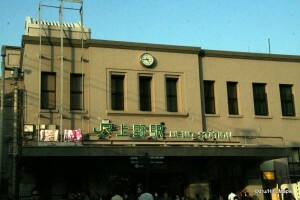 It is known as a transportation hub, home of various museums, Ueno Park, and Ameyokocho. I have mentioned in previous posts that Tokyo’s major centres are all very similar to each other. There is very little variance aside from the size. Ueno is not an exception, but it is still unique in its own right. The area doesn’t have the same feel as Shinjuku or Ikebukuro. 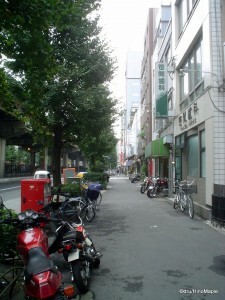 It is smaller than Shibuya, yet retains the character of a major centre. The cherry blossom season is probably the best time to visit Ueno, but a visit at any other time is also recommended. 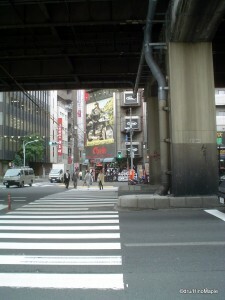 Looking north-east from Ueno station will take you to a fairly unknown area. It was Bike Town. Bike Town was an area along the highway, north of the station. It was hard to find at first, but once you were there, you were greeted with a bike nut’s dream. The area was dominated by a company called “Corin”. This company ran several shops that dominated the entire area. Each shop was slightly different. One would specialize in Harley Davidson parts, another in old two-stroke racer parts. Some had scooter parts, but most sold clothes that looked similar to each other. All of the clothes they sold were either small brands, or their own personal brand. The quality was good, and everything was fairly unique. Unfortunately, as of 2008, reported by a blog post, the company has gone out of business. This is not very surprising. The entire area never looked like it could support that many shops selling the same items. It would appear that they were the victims of trying to do too much in such a small area. In the past, this area was very busy with people selling parts, but in today’s age, it’s not easy as most people can buy parts online. Tokyo city itself is not a good place to have a full sized motorcycle, as Corin tended to specialize in. The area has been transformed from being the bike mecca of Tokyo, to nearly being a ghost town. While the major retailer of the area, Corin, has left, there are still various companies still doing business. Along the main street, under the highway, there are still several shops that have survived the changing times. There are a few bike shops selling new and used motorcycles, and there is the Honda Parts shop. While the Honda Parts shop has “Honda” in its name, and a Honda logo, they are not exclusive to Honda. They do sell a variety of parts that will fit with most bikes. There is also “UPC Ride On”, which is mainly an Arai helmet seller, but they do have other gear for sale. This shop is a personal favourite of mine, and they have various events with a few famous Japanese riders visiting the shop, or signing helmets for them to sell/display. As with Corin, some of these shops have more than one branch along the main street. Be sure to check each one as they don’t always carry the same parts, let alone the same goods. Unfortunately, like Corin, they are starting to carry the same things in each branch, which could be a sign that things are getting worse. If you are interested in buying a motorcycle, do not try to buy one in this area. It might seem like a good area as it is called “Bike Town” for a reason. Unfortunately, it’s mostly a parts and gear town. For those looking to buy a motorcycle, you are better off visiting one of the major dealers. The small dealers here do have nice motorcycles, but I myself find it a little scary to buy from them. They don’t always seem friendly, and you may get a lemon. I have seen nice bikes in a couple of shops, but one of the shops had nothing but very old bikes just collecting dust. Besides the seedy bike sellers, if who love motorcycles, this area is still worth a quick visit. You can still get cheaper helmets and gear from the remaining shops. Unfortunately, due to the ease of online shopping, I wouldn’t be surprised if many more of these shops closed down. You can easily buy the same parts for the same, if not cheaper price online. I would recommend visiting this area soon as I assume that more of the shops might go out of business in the next few years. I wouldn’t be surprised to see a large department store buy several of the buildings and build a new department store in the area. Do beware that buying a motorcycle from a small shop in this area can be dangerous. You are better off going to a big shop that’s outside the city than one of the seedy small ones here. This is part of my series on Ueno. Please continue to read more about Ueno at Ueno – Ueno Park and Ueno – Ameyokocho. This entry was posted in Tokyo and tagged Ameyokocho, Arai, bike, bike mecca, bike town, Cherry Blossom, Corin, Corin Street, Harley Davidson, Honda, Ikebukuro, japan, Kawasaki, motorbike, Motorcycle, scooter, Shibuya, Shinjuku, Shoei, Suzuki, Taito, Taito-ku, tokyo, Tokyo Bike Town, Tokyo-to, Ueno, Ueno Park, Yamaha, アメ, アメ横, スクーター, バイク, 上野, 日本, 東京, 東京都, 渋谷 by Dru. Bookmark the permalink. Good luck finding what you need. Honestly, Yahoo! Auctions is where you’ll have the best luck for used parts, or just scarce parts. That or just go into your trusted bike dealer/maintenance shop and get the parts ordered in. Corin was a great area that needs a revival if it wants to be the bike town it once was. I’m not sure of Uguisudani… It is right next to the station itself. If you are looking from the large pedestrian overpass, it is north of that and next to the station. Between the station and the highway. Should be easy to find, but hard to notice it was a bike town. Maybe I should go back and check it out again.